+ The design or the Moynihan Train Hall is said include 50 percent more space than Penn Station. + It's about 17,000 square feet (7 percent) bigger than the main concourse at Grand Central. + The arches are intended to "evoke the grand design of the early 1900s." + The arched ceiling will include an acre of glass. + The balcony level will be 70,000 square feet with dining and shopping options. This is of interest here, of course, because NYP is by far the most popular destination from Albany-Rensselaer. And Albany-Rensselaer is one of the nation's 9th busiest train station, with more than 825,000 "on offs" each year. If you just want to skip to the renderings, they're at the top of the page in large format -- click or scroll all the way up. 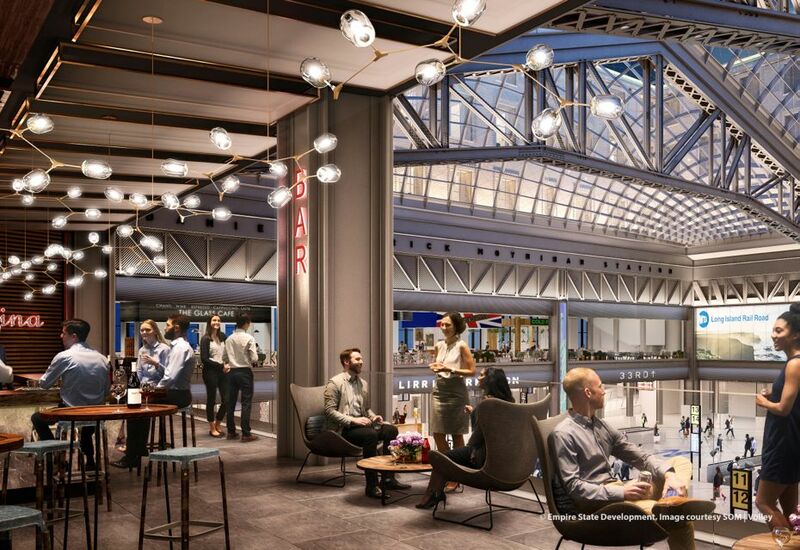 The Moynihan Train Hall will include shops and restaurants located under a new skylight on the building's historic and architecturally dramatic steel trusses. 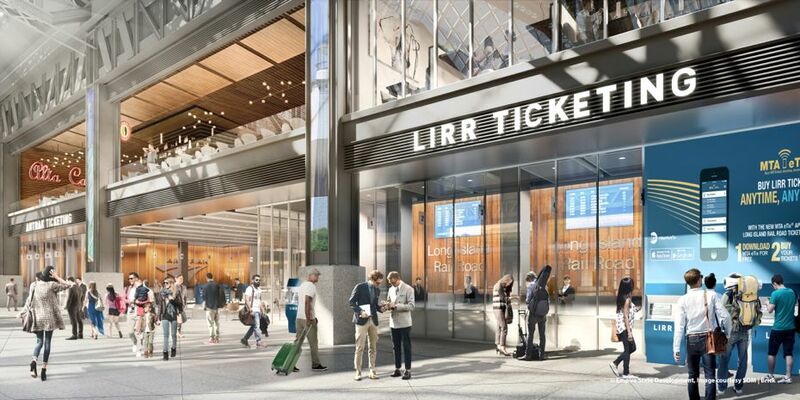 The building will increase floor space 50 percent from Penn Station, and service riders on the LIRR, Amtrak and eventually accommodate passengers from Metro-North. A total of nine platforms and 17 tracks will be accessible from the Train Hall. 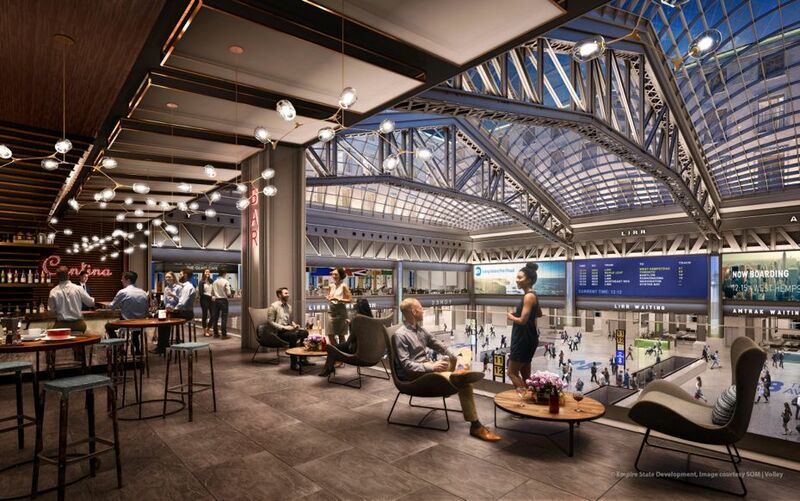 In addition to the Train Hall, RVS will redevelop the entire Farley Post Office Building to include approximately 700,000 square feet of office and retail space which will result in the creation of thousands of new construction and permanent jobs. There will be an underground concourse connecting the train hall to Penn Station. 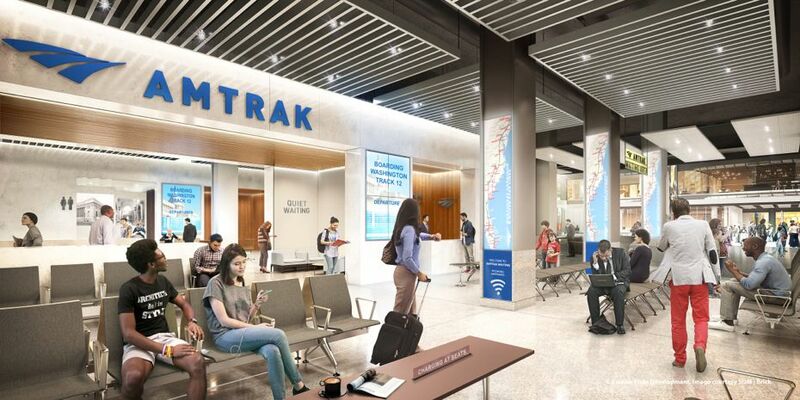 The Cuomo admin says train hall project will be about $1.6 billion and a development team -- Related Companies, Vornado Realty LP, and Skanska AB -- has been selected. About $600 million is coming from the developers for the rights redevelop the Farley Building, $570 million from Empire State Development, and $425 million from Amtrak, Long Island Rail Road, Port Authority, and the feds. Andrew Cuomo said the project is set for completion by the end of 2020. 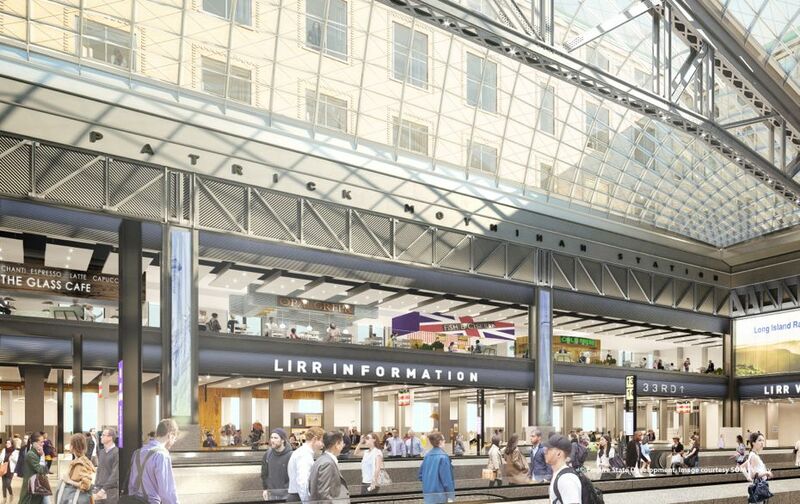 A dramatic redesign of the LIRR portions of Penn Station will significantly improve passenger experience and circulation. 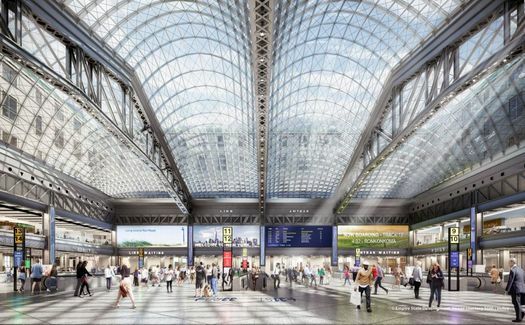 The plan will include nearly tripling the width of the 33rd Street Corridor, which is among the busiest sections of Penn Station and stretches along the station's lower level from Seventh to Eighth Avenue. 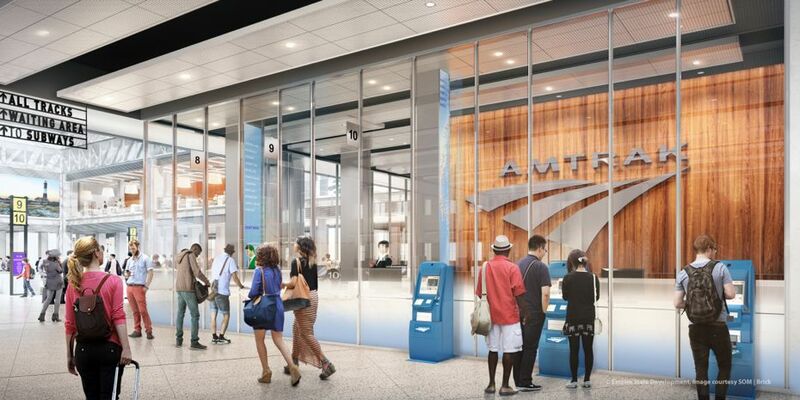 Other improvements will include upgraded lighting and wayfinding, and digital screens to convey information and create a modern passenger experience. It is anticipated that the majority of the corridor improvements will be completed simultaneous to the Train Hall's opening, with other elements completed sooner. Construction of the new LIRR corridor will cost an estimated $170 million. 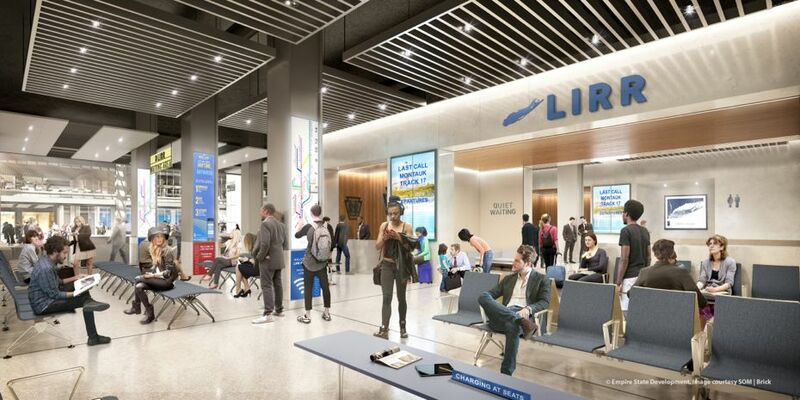 Also: The new LIRR concourse will have an LED screen ceiling that "will appear as a blue sky with clouds." As Cuomo said in his presentation Tuesday: "It really gives you a sense of openness as opposed to being closed in." Back in January when Andrew Cuomo floated this latest iteration of the plan, the new complex was tagged as "Empire State Station." That name wasn't mentioned in the materials released this week. 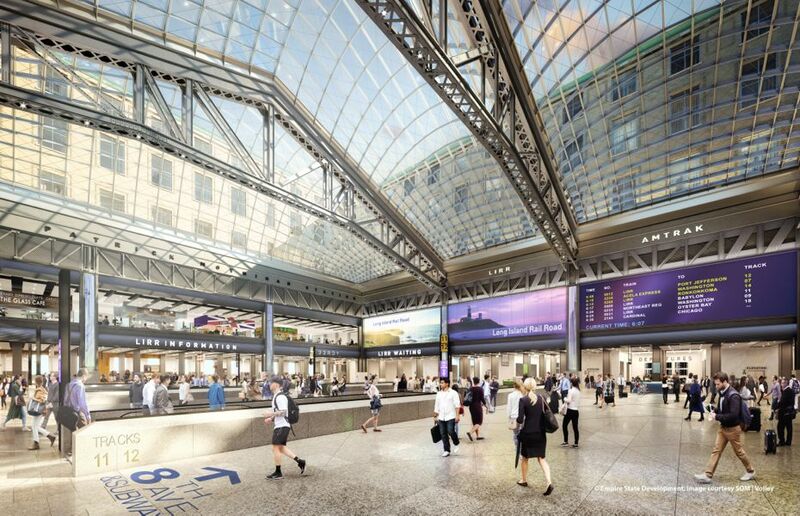 Instead it was referred to as the "Pennsylvania Station-Farley Complex." Because you can't have a major infrastructure project without powerpoint, here's Andrew Cuomo's slide deck from Tuesday. It includes a few other bits if you're curious. Oh we're getting a train station in NYC. Now all we need is a decent train service and we're all set. 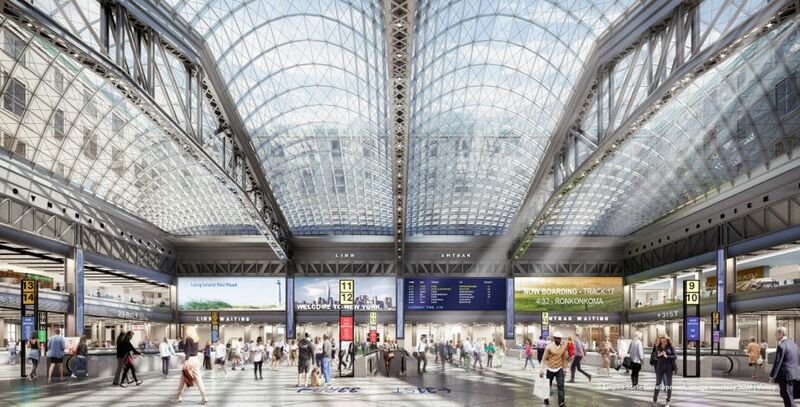 As a recent capital region transplant and former long time NJ transit train rider from Penn station, if these renders are any indication of the design direction they want to go in, it will be a complete disaster. One of the main problems right now with Penn station (besides the fact that its falling apart) are the choke points, where people will crowd and there is barely breathing room when boarding/unboarding a train. If the pictures are really how they plan to build entrances to the terminals then you're just making that problem even worse by putting that overcrowding smack in the middle of the walkways. Can they please include some updated trains too? I find the idea that some of the best intercity train service in the country isn't good enough to be quite amusing, though sadly expected from the Capital Region's compulsive whiners. The only critique that immediately comes to mind: Does it really need screens to display a sky? New York is partly a city of tunnels, so what's the problem with a tunnel? I agree with JayK on the LED sky thing - New Yorkers are used to travelling underground. Why bother with a huge, expensive, fake sky? If anything, just paint the ceiling light blue and uplight it. A LED sky is going to look horrible in time: Big LED screens are made up of smaller panels. There will be panels that die in time, making holes in the sky, and then panels that will be brighter than others once pieces are replaced. It's not so noticeable on a jumbotron playing moving video, but on a mostly-static image of sky, it will eventually look like garbage. Looks great to me! Cool design choice in the glass arches, that reminds me of the Beaux Arts style of Gare d'Orsay in Paris. If you've been in Penn Station, you'll surely notice that it is labyrinthine and cramped. The presentation notes that it now serves triple its design capacity. The wider corridors, increased square footage, glass ceiling, and even the Blade Runner-esque LED monitor ceilings should all help. I'm surprised that people complain about the best public transportation system in the country, I love NY trains.